Book Reviews for books that are age appropriate for 13 year-olds (YA). After the cliffhanger ending of Book #1, my house has been waiting and waiting for Book #2. Where did Rin go? Is he ok? Is he ever going to come back? What about Ozzy and Sigi? Are they ok? There are so many unanswered questions from the first book that need to be answered! One of the biggest questions is if Rin is really a wizard or not. I mean, the scene in New Mexico makes you think one way, but you thought the other way the whole rest of the book. Will Book #2 give us the answers we crave? Or will it too end in a cliffhanger? I’m not going to give anything away, but you might find out some of those answers. Maybe? Haha. Just read it already! 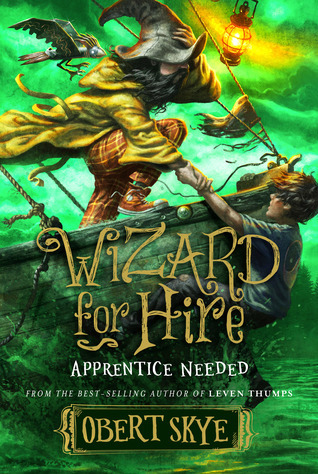 Or, check out my book review of A Wizard for Hire: Apprentice Needed by Obert Skye. “Ozzy Toffy’s adventure, which began in Wizard for Hire, continues when one dark and windy night, he gets out of bed, jumps out his window, and walks straight into the ocean. More than ever, Ozzy could really use the services of Rin, the wizard he hired to help find his parents—but Rin is missing, despite Ozzy’s continual attempts to contact him. And Clark, the mechanical bird his father left him, is as peculiar and vain as ever. When a mysterious package arrives, Ozzy and his good friend Sigi are sure that the plane ticket and thumb drive in it are from Rin. Trying to get Clark through security at the airport proves complicated—as most things are with Clark. But when they arrive in New York, they discover that there’s even more adventure in store for them. Will Rin return and save the day? Can Sigi find a way to trust her delinquent father? Will someone please appreciate Clark the way he’d like to be appreciated? For once? Book #1 sure ended with a bang, right? Wow—can you say cliffhanger? At my house we have been waiting and waiting for Book #2 to come out so we could see what happens. It’s spring break here, thank goodness, and so I had the time to sit down and read. This book is just as crazy as the first one! Things are happening and neither Ozzy nor Sigi understand what that means. Then one day they receive a package, and it sets off a series of events that they will never forget. Buckle those seat belts and get ready for an adventure! I like the writing style of this book. It’s fast-paced, full of action, and full of mystery. Yep, you’re still wondering! Even after the events in New Mexico, you’re still wondering if Rin is really a wizard or not. Is he? Hmmm…no. Well…yes, I think he is. Ummm…no. No way. Haha! That’s a good way to keep your readers reading…make them go crazy wondering. And then to make it worse, Ozzy starts doing some crazy and dangerous things—unconsciously! The day had departed, dashing off like a frightened child as the first slender fingers of dusk gripped the sky. In its absence, darkness arrived at 1221 Ocean View Drive. Like a large visitor whom nobody had invited, the inkiness came early and in force, its arms filled with fatigue and exhaustion. It sat down on everything and moaned like an old man with tired legs and no intention of getting back up anytime soon. English teachers unite! In one paragraph you have personification and several similes. Not every paragraph is like this, but many of them are, and I love it. I don’t think enough authors take the time to craft the language of their books. It’s refreshing. The characters are well developed and realistic. Ozzy, Sigi, and Clark are all great characters. As a reader, you feel like you’re one of them. You feel like you’re there with them and experiencing things with them. Rin is hilarious, and I love all his words of wisdom. My favorite is when Ozzy and Sigi are trying to leave meaningful messages on his phone. I’m going to start doing this, I think. You may only leave a message if you leave an inspirational quote with it. My kids (and husband) would get so irritated! This book answers a few questions, but adds about 100 more! AHHHHH! Yep, there better be a book three! And pronto. ‘Cuz it’s another cliffhanger ending ladies and gents. Of course, the cover art is amazing! The fabulous Brandon Dorman has done it again! You’ll want to read the book just because it has such a fantastic cover! If you want action, suspense, mystery, wizardry—or not wizardry, cool mechanical birds, mind control, car chases, or night-time sailing expeditions, this book is for you! Hang on, though, it’s quite the ride! When the publicist asked if I would review this book I said, “Yes!” because it has a good title. I don’t usually read the blurbs about books, so when I picked it up I totally thought it was going to be MG or YA fantasy. Hahaha! Ummmm…no. This book is not fantasy at all. It’s fiction, but it’s an allegory written about two brothers whose hearts have turned against each other. These brothers happen to be people that lived long ago. The Anasazi. It’s not very long, but it packs a big punch! There’s a lot of wisdom and knowledge squeezed into a few pages. There are many lessons to be gleaned from this story. 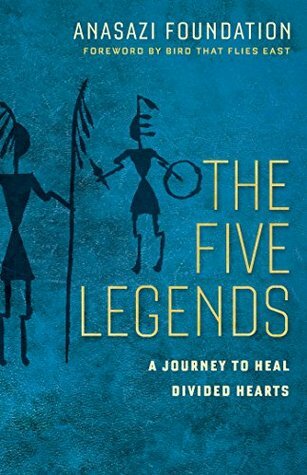 Find out more in my book review of The Five Legends by the ANASAZI Foundation. “Drawing on thirty years of helping families in crisis, this profound fable by the ANASAZI Foundation illustrates the anguish of conflict and shows how we can end war within ourselves, within families, and even between nations. When I agreed to review this book I had never heard of the ANASAZI Foundation. It sounds like an amazing program. The ANASAZI Foundation is a nonprofit 501(c)(3)that is based in Arizona. It’s a “wilderness therapy program for young adults and youth at risk [and has been] recognized internationally for its caring and nonpunitive approach to helping youth overcome challenges and see their seeds of greatness.” This program “gives young people an opportunity, through a primitive living experience and a philosophy that invites healing at the hands of nature, to effect a change of heart—a change in one’s whole way of walking the world…[It gives youth] a place free from distractions, where one can learn, ponder, and build” If you’d like to learn more about the ANASAZI Foundation, you may find more information at: www.anasazi.org. Now onto the story. Picture two teenage or early-twenties young men. Brothers. They are the sons of their people’s leader, and they do not get along. They argue and disagree with each other. When their father passes away the disagreements come to a head and the two brothers go different ways. Each leads his people, and each blames his brother for the rift, heartache, and all his problems. Many years pass, and with each passing year their hatred of each other increases. Then something happens that brings them together for the first time in many years. An accident follows, and they embark on a journey to mend their divided hearts. This book is very well written. It flows well, is easy to read and understand, and I really like the writing style. Somehow it makes you feel calm and peaceful even when it’s discussing war and fighting. I loved reading about the Five Legends of peace. This book is broken up into different sections, and I didn’t find it off-putting or difficult to read. The character development is very well done. You feel like you are feeling the emotions of the characters. My favorite thing about this allegory is all the lessons that it packs into its slim 96 pages. Wow! You’ve got forgiveness and repentance. You have looking inside yourself first before placing the blame on someone else. There’s also the importance of family and living a life of WE. I love that one! We can’t do much by ourselves, but when WE work together, we can do amazing things. You also have the importance of seeing each other as people. Real people—with feelings, dreams, hopes, strengths and weaknesses—people who are doing their best. We need to look at the positives and the good in people before we focus on everything that is wrong. I think the journey the brothers take is significant also. Being together and doing things together on this journey through life is what bonds us together. Also, life is a journey. Sometimes bad things happen, and sometimes good things happen along the way. There may be times where we get lost or lose our possessions. There may be times along the way where we feel like we can’t go on or we lose hope. What’s important is the connections in our lives—our connections to other people. It’s living a life of WE instead of me. It’s the importance of looking outside ourselves and seeing other people. Really seeing them. I liked this book a lot. I loved watching the characters grow and develop along the way, and I loved all the symbolism and lessons. This book teaches some very important lessons that are needed in today’s world. I highly recommend this book. I think it would make a great family or school read-aloud too! I swear, everywhere I turned, James Clear was there talking about his book. I heard him on several podcasts, heard other people talking about it, and then I kept seeing his book everywhere. Well, it worked. All that promotion definitely caught my attention. I reserved Atomic Habits at the library and then waited. After a brief wait, I checked the book out and brought it home. I was super excited to read it. Then life happened—school, kids, house, other books—and I kind of forgot I had the book. That was, until I got an email saying it was due back to the library. Oops! I hadn’t even started it yet. Guess what I did? I started the book. Yep, I didn’t take it back. That was a couple of weeks ago, and I just finished the book. Ummm…yeah, I’m going to have quite the fine, but I had to finish! 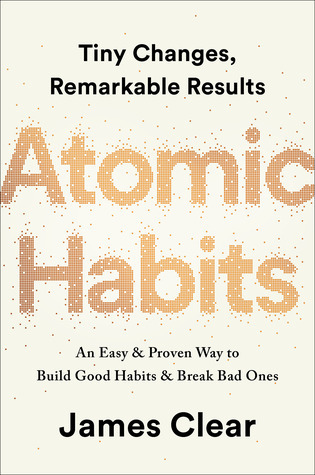 If you haven’t heard anything about this book, check out my book review of Atomic Habits by James Clear. “No matter your goals, Atomic Habits offers a proven framework for getting 1% better every day. James Clear, one of the world’s leading experts on habit formation, reveals practical strategies that will teach you exactly how to master the tiny behaviors that lead to remarkable results. If you’re having trouble changing your habits, the problem isn’t you. The problem is your system. Bad habits repeat themselves not because you don’t want to change but because you have the wrong system for change. You do not rise to the level of your goals. You fall to the level of your systems. In Atomic Habits, you’ll get a plan that can take you to new heights. Clear is known for his ability to distill complex topics into simple behaviors that can be readily applied to daily life and work. Here, he draws on ideas from biology, psychology, and neuroscience to create an easy-to-understand guide for making good habits inevitable and bad habits impossible. Along the way, readers will be inspired and entertained with true stories from Olympic god medalists, award-winning artists, business leaders, life-saving physicians, and star comedians who have used the science of small habits to vault to the top of their fields. I know you’re asking…was it worth the big fine at the library? In a word, yes! I have never thought about habits in this way. It is clearly a new way of thinking, and it takes a bit of a shift in perspective. However, once that shift is made, I think it will be difficult to go back to the old way of thinking. Clear makes it seem so easy! This book is very well written. His writing is clear and to the point. His writing style is easy to read and understand. The book has a great progression from small to big-picture, and each chapter is well thought-out and full of ideas. I like the chapter summaries at the end of each chapter that give the reader quick bullet points to remember what was taught. There are also diagrams throughout each chapter that do a great job of illustrating his points. I love the examples that Clear uses to show and explain his thoughts and ideas. He uses Olympic athletes, professional sports coaches, and important business people’s routines and processes to show how it all works, and it makes it seem so simple! He’s not naïve, though. Clear knows that it’s harder than it seems, so he does a good job explaining how easy it is to fall off the habit-train. What’s great is that he gives you ideas on how to make it easier to start, follow, and continue habits. I feel so ready to start some habits! I’m pumped, and I’m also ready for the long-haul. This truly is a remarkable book. It’s filled with a new way of thinking about habits, and a simple shift in perspective that will allow people of all shapes, sizes, backgrounds, and abilities to improve their lives. This book aims to make people the best they can be, and I’m excited to get started! Have you ever thought of yourself as something unlovable or scary? It starts as a small idea and then festers into something uncontrollable and real. I think everyone has short moments where they may think that of themselves. Sophie thinks this of herself constantly. She’s convinced she’s a monster, which breaks my heart. No one should think that, especially a child. She got the idea from her favorite book—The Big Book of Monsters that she always keeps with her. Yes, it’s big and heavy, but that doesn’t stop her from carrying it everywhere. It’s how she determines which monsters or creatures are living around her—so she can protect herself. 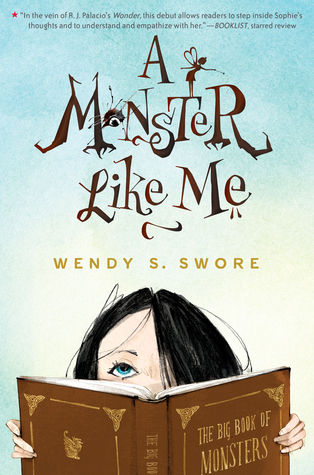 Find out more in my book review of A Monster Like Me by Wendy S. Swore. “Being the new kid at school is hard, but Sophie has a secret weapon: her vivid imagination and her oversized, trusted Big Book of Monsters—an encyclopedia of myths and legends from all over the world. The pictures and descriptions of the creatures in her book help her know which kids to watch out for—clearly the bullies are trolls and goblins—as well as how to avoid them. Though not everyone is hiding a monster inside; the nice next-door neighbor is probably a good witch, and Sophie’s new best friend is obviously a good fairy. Sophie is convinced she is a monster because of the ‘monster mark’ on her face. At least that’s what she calls it. The doctors call it a blood tumor, and it covers almost half of her face. Sophie can feel it pulsing with every beat of her heart. And if she’s a monster on the outside, then she must be a monster on the inside, too. She knows that it’s only a matter of time before the other kids, the doctors, and even her mom figure it out. As a mom and a teacher, it breaks my heart to think of this darling girl thinking something so terrible of herself. She has a blood tumor on her face, and it’s big. You can see why she’d think of herself as an ugly monster. The problem is, she can’t figure out which kind. She’s read her book dozens of times, and she can figure out what everyone else is, but she can’t find a description that matches her monster-type. She must be one, though, because she’s ugly, and it would explain why her dad left her. Once again, it makes me so sad that she thinks of herself in this way. This book is so well written. Sophie’s voice in the story is sweet, real, and protective of her secret. Her thought process is realistic and child-like, and it draws you into the story. The descriptions of the monsters are witty and clever. I love how quick Sophie’s mind worked to match a person to a monster. It works because we all tend to judge people by their appearance and actions (whether or not those judgments are accurate is a different story), Sophie just goes a step further and puts a monster description with it. The character development in this book is fantastic. You feel like you know each of the characters personally, and they come to life on the page. Sophie is well developed, likable, imaginative, and spunky. Sometimes I cringe with her because she has a bit of temper sometimes. Autumn is so sweet and fun. Just like a fairy. Mrs. Barrett reminds me of my grandma and Sophie’s mom is realistic, has her flaws, and has her strengths. I think she’s really good for Sophie. I do feel bad that Sophie feels like she can’t tell her mom everything she’s feeling. This is such a clever story. The way Sophie’s imagination puts everything together is so imaginative and unique. It’s like living in a whole imaginary world. Having four kids myself, I can see that she’s using it as a coping mechanism to help her deal with her reality. And, she’s using it as a way to hide. It’s a good lesson to learn, though. There are quite a few great lessons and values in this book: friendship, the importance of relationships, learning that everyone has trials to overcome, not being judgmental, and the importance of talking about your problems. A Monster Like Me reminds me of Wonder. It’s important for children and adults to read stories like these because it tends to put things in perspective. Learning lessons from a book Is a lot easier and less painful than learning them in real life. I loved this book and think the middle-graders and YA will also love it! If you liked Wonder or Mustaches for Maddie then you will enjoy this book. I highly recommend A Monster Like Me by Wendy S. Swore. This book would also make a great read-aloud. Sophie’s story is dear to my heart because I know how it feels to be bullied because I looked different from everyone else. When I was a child, I had a hemangioma on my forehead that stuck out so far my bangs couldn’t cover it, no matter how hard my mother tried. Because the tumor was made up of blood vessels, I could feel my heart beating inside it when I was playing hard or really upset. The incident at the grocery store where the hydra lady says, “Hey, look kids! That girl doesn’t need a Halloween costume. She’s already got one!” is an exact quote of what a woman once said to my mother and me. Another woman told a classroom full of kids that I had the mark of the devil. Kids asked if it was a goose bump, or hamburger, or if my brains had leaked out. My dad had to chase away some bullies who had followed me home, called me names, and pushed me into the street. Sometimes, after a bad day of bullying, I wished I could just rip the mark off my face and be like everyone else—but it was a part of me, and wishing didn’t change that. My parents decided to take an active role in educating the people around me so they would know what a hemangioma was and understand that it wasn’t icky, or gross, or contagious. Whenever we moved to a new place, my dad would go with me to the elementary school and talk to the kids about my mark and let them ask questions. After those talks, kids befriended me and noticed when bullies came around. Like Autumn, my school friends would speak up when they saw someone being mean to me, and sometimes they would stand between me and the bullies until they left me alone. I didn’t let the bullies stop me from doing what I wanted to do. I climbed trees, went swimming, wrote poetry, brought my tarantula and snakes to show-and-tell, and played in the tide pools. This is my message to anyone who experiences bullying: Don’t let the bullies define you! I’ve been there, I know it hurts to be teased, but don’t let it stop you from doing what you want. Find something you enjoy—a hobby, talent, or challenge—and practice that skill. Know that someone out there, maybe even someone in your same school, needs a friend as much as you do. Be that friend. Stand up for each other. And know that you are not alone. You can always find me at WendySwore.com, and I would love to hear your stories and what you thought of the book. When I grow up I want to be a potion master! Seriously. It sounds like so much fun! Brewing potions that make you weigh as much as a car or make ivy grow all around you sounds like so much fun! I really like this blind batching stuff. Who knew that some people are so smart that they can come up with new potions on the fly? Yep, I want to be a potion master. I’ve probably already passed the age of showing my ability, but who knows? It sounds so fun! I mean, you are always in danger, with evil forces constantly working against you, but that’s a small price to pay for all that fun, right? Right? 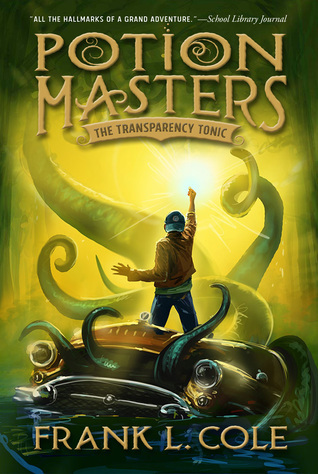 Find out in my book review of Potion Masters: The Transparency Tonic (Book #2) by Frank L. Cole. “It has been nine months since Gordy and his friends, Max and Adilene, stopped Esmerelda from destroying B.R.E.W. (the Board of Ruling Elixirists Worldwide) and the Vessel—the main source of power for the secret society of potion masters. Gordy is starting the eighth grade, and has been practicing new potion brewing techniques, but when he starts zoning out during practice, he knows something is wrong. Gordy and his friends continue to work on their potions, but when Gordy chooses Max as his lab partner, Adilene starts to wonder if she still has a place with her old friends. She turns to a new friend, Cadence, who might know a way to help Adilene become a potion master on her own. And in Greenland, Mezzarix has a chance to escape his Forbidden Zone—as long as he agrees to work with the mysterious Ms. Bimini and replicate an unusual solution known as ‘Silt.’ It could be just the weapon Mezzarix needs to destroy B.R.E.W. forever. First off, I love the cover of this book! Owen Richardson did a great job with the cover art. This series is so fun! I loved the first book and couldn’t wait to get my hands on the second one. My kids enjoyed it as well. Even my big 15 year-old enjoyed this book. In my sixth grade classroom, many of my students have also read the first book and enjoyed it. Needless to say, I was excited to read book #2! The book starts off with Gordy trying out a new potion called ‘Trapper Keeper.’ Fun stuff! I seriously love the creativity in this book! Frank Cole has quite the imagination! For example, Bolter’s car is hilarious! Estelle the cat car—she has many feline characteristics, but my favorite is the oily mesh and wire ‘hair ball.’ Haha! And the different potions that Gordy comes up with are so great! I love the potion that makes the person weigh as much as a car. I’m not sure when I’d use a potion like that, but I bet it could come in handy at times. I love the characters. Gordy, Max, and Adilene are great characters. They have different personalities, strengths, and weaknesses, and yet they work well together. I like that they’re not perfect and they still act like eighth graders. Mezzarix is scary. Evil. Brilliant. Creepy. He makes a good bad guy! There are some of our favorite characters in this book, and there are a few new ones as well. They’re well developed and well written. Frank Cole’s writing is witty, descriptive, captivating, and so creative. His writing style is engaging, and it pulls you into the story. There are a few different story lines in the book, and they all come together very well. This book is well written—I couldn’t put it down, and I’m a mom! The middle-graders are going to love this book! If your child has read and enjoyed the first book…run, don’t walk, to pick up this one! I have been waiting for this final book in the Ragesong series for a long time! I was so excited when J.R. Simmons finally emailed me asking me to review it! This is such a fun and unique series. I love the use of music, the characters, and how they can use the music together to accomplish more. Just wait until you read about how Jake, Sam, and Klyle learn to use the Trichord together. What? It’s pretty amazing, I must say! It’s too bad there isn’t a modern-day, actual version of the Trichord. Of course, I guess we couldn’t risk it falling into the wrong hands. 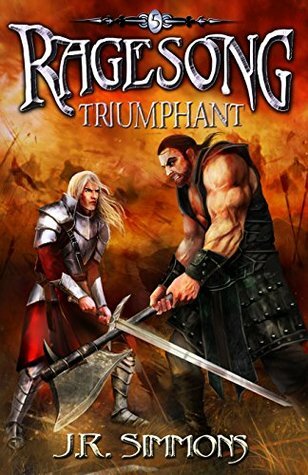 I hope you enjoy my book review of Ragesong: Triumphant (Book #5) by J.R. Simmons. All three unite in this epic conclusion to the thrilling Ragesong saga. The Dread King Brael controls nearly all of Fermicia. Only an exiled king and three rogue territories remain free of his dark clutches. With nowhere left to run, King Klyle and his allies, the Dextori Freedom Fighters and the Riders of Southern Reach, engage Brael, his ruthless Elites, and an infinite army in Fermicia’s last stand. Klyle’s last hope rests with Jake, Sam, and a mythical artifact that may save them all—if they can find it. As they journey into the snowy fields of the Untamed North, war threatens to engulf the land, and a savage enemy surrounds Jake and Sam on their quest. I have seriously enjoyed this series. I’m so sad it’s coming to an end. Jake, Sam, Klyle, Joraus, and Swyf, have become close friends over the years. I have enjoyed getting to know some new friends along the way as well. Shivarra, Ara, and Buvielio are some of my favorites. The characters are very well developed. They’re realistic and imperfect. They make good choices and poor choices, and learn from their experiences. This book is also very well written. I like Mr. Simmons’ writing style because it’s easy to read, but it’s not simple. There are complexities in the story line, along with twists that take you for a ride you weren’t expecting. I loved what the Trichord was able to do. The concept is very unique and creative. Ragesong: Trimphant is the culmination of the story, and it was one of my favorites. It was a bit violent, since it’s a war and all, but I thought it came together very well. A few friends were lost along the way, which is super sad, but I liked the ending. I thought it brought all the loose ends together in a good way. It wasn’t too happy or too sad. Just right. If you’re ready to get lost in Fermicia and learn all about Ragesong and the powers it has, I highly recommend this series. And of course, this book! You have to see what happens! 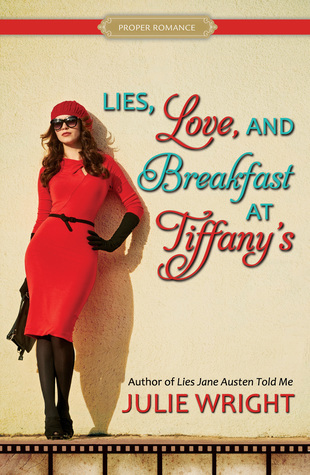 I loved Julie Wright’s previous book Lies Jane Austen Told Me, so I was pretty excited to read this book. The only problem was that I am a huge Jane Austen fan, so the previous book fit me perfectly. I truly (gasp!) don’t know anything about Audrey Hepburn. I have not seen any of her movies, so going into it I hoped I could feel a connection with this book anyway. I needn’t have worried–Ms. Wright has a fun writing style that draws you into the story and makes you feel right at home. The only problem now? Now I really want to watch an Audrey Hepburn movie so I know what everyone is talking about! Anyone want to do an Audrey Hepburn marathon with me? Women in Hollywood are just pretty faces. But Silvia Bradshaw knows that’s a lie, and she’s ready to be treated as an equal and prove her worth as one of Hollywood’s newest film editors. She and Ben Mason had worked together as editors before Silvia got her big break, so he’s the perfect person to ask for feedback on her first major film. But even as their friendship begins to blossom into something more, a lawsuit surfaces, jeopardizing both Ben and Silvia’s jobs—as well as their fledgling romance. Audrey Hepburn one said: ‘The most important thing is to enjoy your life—to be happy—it’s all that matters.’ Silvia agrees. Or she used to. It’s one thing to risk her job and her heart, but can she really risk Ben’s too? Does she have the right to make decisions for her own happiness when they affect so many other people? Silvia is a film editor at a major production company. It turns out that it’s quite the accomplishment for a woman because there aren’t many women film editors out there. She routinely recognizes that she is the only woman in the room. Many of those good ol’ boys still have an antiquated view of women, and it isn’t a good one. They aren’t very accepting of women in their space. She holds her own, though! She works hard and does a very good job. In fact, she does such a good job that she may even be recognized for her work. Then, one fateful night, a drunk boss and a looming deadline collide. What is she going to do? How will she get the finishing touches on the film ready for the next day’s meeting? I’m not telling. Nope, you’ll need to read it. I don’t want to give anything away. Just suffice it to say that what happens next changes the course of her life. No biggie. Silvia is such a fun character. She is relatable, personable, real, and likable. She’s a strong female character, which I love. Silvia is not perfect, by any means, and that’s one of the things that makes her such a great character. She can be a little clueless when it comes to recognizing how others feel about her, but she eventually catches on. I love her voice in the book. I don’t know anything about editing movies, but all of that seemed legitimate to me. It was fun watching her growth over the course of the book. I loved many of the other characters as well. Silvia’s grandma is a darling lady, and I loved her spunkiness. I liked Emma’s character because she reminds me of my bestie. She’d do anything for Silvia, but she also tells her like it is. Walt seems like a genuine gentleman, and I thought it was great when he came into the picture. Ben is well developed, and seems like such a great guy—for most of the book. There were a few times that I wanted to scream at him, but he’s a guy. They’re a little clueless sometimes. When I had about 45 pages left, I seriously doubted that everything could be figured out by the end of the book. “Ahhhhh!!!! What.Just.Happened? No. What?” Those were just a few of my thoughts. Yep, there’s quite the revelation, and it threw me for a loop, for sure! I didn’t want to believe it, but there it was. Keep reading. That’s my advice. I won’t say anything more…don’t throw the book out the window. Keep reading. There were a couple of things I noticed that were missed by the editors–they didn’t quite fit, but I have an ARE (Advanced Reader’s Edition), so they should hopefully be fixed in the for sale copy. I liked this book a lot! I stayed up too late last night finishing it, but I couldn’t put it down. The characters are well done, relatable, and realistic, and the writing style just draws you in. It’s a fast, entertaining, weekend read. Even though I don’t know anything about Audrey Hepburn, I still enjoyed it. 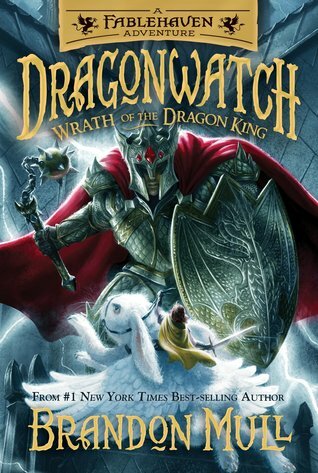 I reviewed Dragonwatch (Book #1) about a week ago, so I’m super excited to be able to share my book review of Dragonwatch: Wrath of the Dragon King (Book #2) by Brandon Mull with you today! It’s great when you can read book 1 and book 2 within a week of each other because then you don’t forget everything in between! I had to read this book quickly because as soon as it arrived I had three kids fighting over who got to read it next. And they’re all teenagers! That’s the sign of a good book, for sure! All three of them read and loved Fablehaven and have been Brandon Mull fans ever since. “After a humiliating defeat at the hands of Kendra and Seth, Celebrant, King of Dragons, prepares to unleash his fury and take control of his native preserve. Two of the seven dragon sanctuaries have already fallen. Will Wyrmroost be next? Armed with secret information from a new ally, Celebrant seeks a talisman that will guarantee victory in the war against the humans. With a cursed castle and traitorous creatures standing in the way, Kendra and Seth must attempt to foil Celebrant’s plan and beat him to his prize. What’s not to love about two children stepping in as caretakers of one of the biggest and most dangerous dragon preserves in the world? This book has everything: dragons, other exciting creatures, deception, battles, journeys, friends, foes, victories, defeats, and castles. There are some new friends and, unfortunately, some new enemies. There’s action, adventure, and—something I’m excited about—the Tiny Hero is back! Kendra and Seth get invited to a dinner party at Celebrant’s castle, and suddenly everything they’ve hoped for gets dashed to pieces. One declaration from Celebrant changes everything, and not for the better. How will they rise above the challenge? Will they be able to save themselves and the preserve? Let me tell you—there are some tense moments in this book! Be prepared! Jump on your griffin and hang on for the ride! As always, Brandon Dorman did an amazing job with the cover art! A flying bunny—what? I love his art, and the kids do too. Yes, we all judge books by their covers (admit it), and judging by this fantastic cover, this book is, well…fantastic! Brandon Mull does a great job of setting the stage and putting you inside the story. As Kendra and Seth sit at dinner at Skyhold with the other inhabitants of Wyrmroost, you’re right there with them. As they travel through the preserve, you’re right there with them. As they face challenges and their skills are put to the test, you’re right there with them. He also does a great job with character development. Kendra and Seth are such great characters. They make mistakes, but try their hardest. I love that Tanu is back, and Eve and Calvin are such fun additions to this new series. I also love the talking animals in the Zowali Protectorate. The bear that finds Kendra has a funny dry wit. Doren and Newel are still hilarious, and watching the Somber Knight in action is pretty awesome. This is such a fun book! I really enjoyed it. It’s fast-paced, full of action and adventure, and has some fun surprises. The characters’ abilities are tested every step of the way, and I love the lessons they learn in the process. I also love some of the new “tech” introduced, like the cloak of innocence and the bow that can shoot 100 arrows at a time. Yep, fun stuff! If you liked Fablehaven or the first Dragonwatch then you will love this book. If you haven’t read them yet, definitely read them before you read this one! And do it quick so you can get to this book quickly! I’m not going to hear the end of this one for awhile! I am a very strict, “No Christmas until after Thanksgiving!” kind of gal. My kids want to listen to Christmas music right now, in October, and I say no. So, when they find out that I just read and am now reviewing a Christmas book, well, yeah, they’re never going to let it go. I know they’re going to think it’s okay to put up the Christmas decorations and start going Christmas-crazy. Ummmm…..yeah no. This is a fun little book, though. It’s not all about Christmas—there’s a love story in there too! Want to know more? 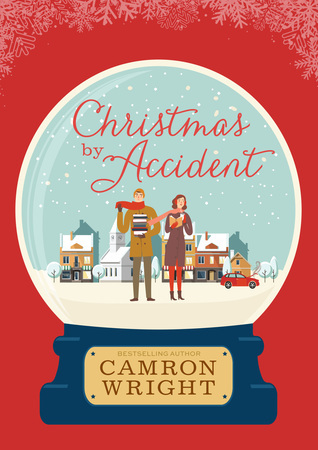 Read all about it in my book review of Christmas by Accident by Camron Wright. “There are no accidents where love—and Christmas—are concerned. Carter is an insurance adjuster whose longing for creative expression spills over sometimes into his accident reports. Abby works for her adoptive father, Uncle Mannie, in the family bookstore, the ReadMore Café. Carter barely tolerates Christmas; Abby loves it. She can’t wait past October to build her favorite display, the annual Christmas book tree stack, which Carter despises. When an automobile accident throws Carter and Abby together, Uncle Mannie, who is harboring secrets of his own, sees a chance for lasting happiness for his little girl. But there are so many hurdles, and not much time left. Will this Christmas deliver the miracles everyone is hoping for? Besides the fact that this is a Christmas book, and it’s October, it’s a cute story. I like the writing style because it’s easy to read. It’s hard to describe, but I would say that it’s laid-back and easy-going. Although there are a few intense moments, you never feel rushed through the story. I like it. He describes things well, and even while you’re reading about a car accident as it’s happening, you kind of feel like it’s happening in slow motion. It’s as if he takes the time to notice details that one would never recognize in such an intense moment, and it slows everything down for the reader. I like the characters in the story. They’re all likable and easy to relate to. I think they’re well developed and realistic. Abby is my favorite. If I weren’t a teacher, I think I’d be a librarian or work in a book store. Abby gets to work in a book store (I wish it were real because I’d love to try out their treats!) and loves to read, which makes her my new best friend. She doesn’t seem to engage in girl-drama, which is good. She has her priorities straight. I love the relationship she has with Mannie. Carter kind of floats through his life. He doesn’t seem to have any motivation or ambition. He’s not happy, but not upset enough to change either. I do think it’s hilarious that Carter embellishes his accident reports and makes them sound like intense novel story lines. It’s fun to watch him grow throughout the story. This is a fun book. It’s not too Christmassy; it could be read any time of the year, but it would be fun to read at Christmas. It’s a little cheesy in some parts, but not too bad. It’s an easy, fun, entertaining read. I liked the little lesson nuggets thrown in throughout the book: honesty, family, love, forgiveness, being brave and going for it, prayer, and miracles. It does have a touch of faith and prayer in it, but it’s not the main focus. My kids and I were so excited to hear that Brandon Mull would be writing a break-off series to Fablehaven! As soon as this book came out, we had it in our hands. And they all read it. And they all read it again. “Mom! You need to read Dragonwatch!” “Mom, why haven’t you read it yet?” “Mom, when are you going to read Dragonwatch?” So, here I am, finally getting around to reading it. Just in time because I get to review book #2 very soon! So…drumroll please…I (finally) present my book review of Dragonwatch by Brandon Mull. “In the Hidden Dragon sanctuary of Wyrmroost, Celebrant the Just, King of the Dragons, plots his revenge. He has long seen the sanctuaries as prisons, and he wants nothing more than to overthrow his captors and return the world to the Age of Dragons, when he and his kind reigned without borders. The time has come to break free and reclaim his power. No other person is capable of stopping Celebrant and his dragon horde. It will take the ancient order of Dragonwatch to save the world from destruction. Long ago, Dragonwatch was a group of wizards, enchantresses, dragon slayers, and others who confined the majority of dragons into sanctuaries. But nearly all of the original Dragonwatch members are gone, and so the wizard Agad reaches out to Grandpa Sorenson for help. As Kendra and Seth confront this new danger, they must draw upon all their skills, talents, and knowledge to battle against forces with superior supernatural powers and breathtaking magical abilities. I’m so excited to get to spend more time with Seth and Kendra! I have to admit that I really hoped Brandon Mull would write more about them! This adventure is a bit overwhelming for them, but I’m sure they’ll live up to the challenge! I love that Seth is still Seth. He’s curious, mischievous, a boy, and has a difficult time listening to (and following) instructions. Sometimes this works to his benefit, but other times it gets him in big trouble. Kendra is more relatable because she is more like me: a rule follower. I cringe every time Seth talks or walks or gets an idea. Kendra, on the other hand, reminds me a little too much of me. She can be a little bossy (this for sure doesn’t describe me at all—just so you know), kind of a know-it-all, and she follows the rules with exactness. It’s interesting to see how these qualities benefit her, but they can also sometimes, just sometimes hinder her. I like that she is a strong character, though, and she isn’t afraid to speak her mind. Even if it’s to a big, scary dragon! There are a few new characters in this book, and my favorite of the new characters is the Tiny Hero. He is awesome. Henrick the alcetaur is also pretty cool. I didn’t even know what an alcetaur was, do you? He’s like a centaur, but he has the body of a moose. There you go, you learned something today! The Somber Knight is…yep, you guessed it—somber! This book is so fun! Seth and Kendra have a huge task ahead of them, but they have good attitudes, are willing to work hard, and they are very brave. I like that they need to do it together. They each have a role to play, and they are very good at those roles. I like that they each have time to shine individually as well as together. The book is well written and so much fun. I loved the challenges they faced, and the solutions they came up with. It does kind of follow the same pattern as the Fablehaven books, but that’s not really a complaint because I liked those a lot. 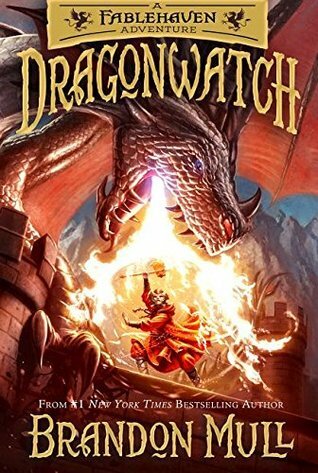 If you enjoyed Fablehaven, you will definitely enjoy Dragonwatch! I highly recommend both series, especially for middle-graders and early YA. Oh yeah, and anyone who loves a fun story! I just have one question: when does book #2 come out? Oh yeah…next week! Stay tuned next week for my review of Dragonwatch book #2! !